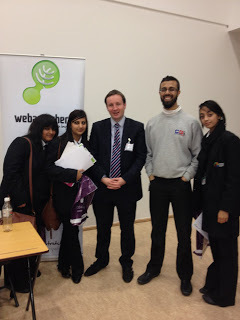 Today I went down to the local careers fair at University Academy Keighley. An event organised to help pupils find out about some of the great employment opportunities in our local area. For me, it was also a chance to show young people that despite the tough economic climate, it’s still possible to take a leap into working life. I had a great time meeting the school students. The fair was well organised and I was bowled over by everyone’s enthusiasm to get involved. I’m a big believer in providing opportunities to school leavers in local communities, so we regularly take on interns and work experience candidates to ensure young people get a good start in life. With the commitment displayed today, I’m hoping to see a few faces from University Academy Keighley turn up on our doorstep in the future. This entry was posted in careers, careers fair, interns on November 17, 2011 by Sean Gilligan.